Exploiting the multi-core performance of Tilera’s Tile-GX72 processor, the AMC741 is the latest advanced mezzanine card (AMC) from VadaTech. 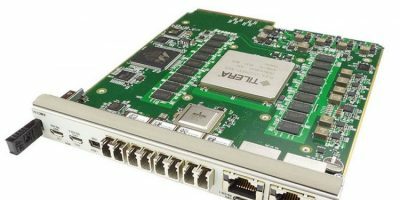 The AMC741 is intended for use in packet filtering, intelligent networking, multimedia, video transcoding and cloud applications. The GX72 device includes 72 identical processor cores (or tiles) interconnected with Tilera’s iMesh on-chip network, making it particularly suitable for high bandwidth networks. Each tile consists of a full-featured, 64-bit processor core as well as L1 and L2 cache and a non-blocking Terabit per second switch. The high processing density and high internal bandwidth of the GX72CPU make it well suited to intensive computing tasks in data centres and enterprise networks. The AMC741 is available in a mid-size AMC format and can be integrated into a 1U chassis. VadaTech provides embedded computing from board-level products, chassis-level platforms, to configurable application-ready systems. The company focuses on AdvancedTCA, MicroTCA, VPX and PCIe products, with its combination of electrical, mechanical, software, and system-level expertise to provide customised commercial or rugged computing. VadaTech also offers specialised products for VME, CompactPCI, and other architectures. The company is a member of PICMG and VITA organisations. The company’s headquarters, design and manufacturing facilities are in Henderson, Nevada, USA. There are design, support and sales offices in Europe and Asia Pacific.